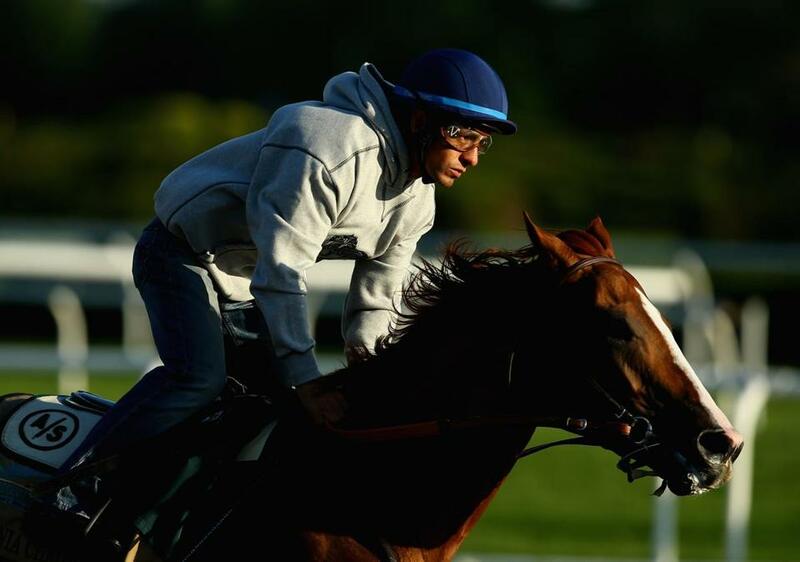 Derby and Preakness winner California Chrome, with jockey Victor Espinoza up, will be a heavy favorite in Saturday’s Belmont Stakes. When the starting gate snaps shut behind him at approximately 6:52 p.m. on Saturday at Belmont Park, the amount of time separating California Chrome from history will be roughly 150 seconds. If he’s fastest to the finish line, winning the Belmont Stakes and giving horse racing its first Triple Crown winner since Affirmed in 1978, California Chrome will be forever celebrated for his performance in the Kentucky Derby, Preakness Stakes, and Belmont. Should he end this 35-year drought, the accomplishment might rank even higher considering the colt’s pedigree. While California Chrome’s family tree includes racing royalty, those famous names are only found when looking back four and even five generations. His more recent lineage would be termed modest at best, and certainly doesn’t offer many clues that could have predicted what’s happened on the track these last few weeks. Maybe that’s the real beauty of California Chrome’s story. A thoroughbred that cost barely $10,000 to produce already owns two jewels, and needs one more to leave his mark on the sport of kings. Before he won the Derby, his owners rejected a multimillion-dollar offer for a partial stake in their horse. How inexact? At the 2012 yearling sale at Keeneland in Lexington, which would have featured the current 3-year-old class eligible for Triple Crown races, none of the 77 most expensive sales were horses who ran in this year’s Kentucky Derby. California Chrome wasn’t among them. Born in Coalinga, Calif., he was an inexpensive byproduct of bringing together two horses who didn’t command very much respect. The stud fee at the time for California Chrome’s father, Lucky Pulpit, was a paltry $2,500. California Chrome’s mother, Love the Chase, was purchased for $8,000, and California Chrome was her first foal. Neither parent ran particularly well during their racing careers, combining for four victories in 28 starts. Breeding is big-money business, with the best sires bringing stud fees reaching six figures. Waldman managed the stud career of Storm Cat, who fetched $500,000 at his peak. But bringing together the best stallion and the best mare for a few private seconds in the barn doesn’t always mean they’ll produce a world-class stakes winner. Plenty of things work against future stardom: nature, competition, the law of averages. Reality. “I think it’s important to remember that it’s livestock being bred here, and you can only be so precise when you’re trying to breed,” said Bill Oppenheim, an industry analyst and consultant. “Even when we’re talking about human beings, full brothers and sisters can be vastly different, not only in temperament but in looks. Breeders — and handicappers, too — pay close attention to bloodlines, and if you go back far enough, California Chrome touches some very successful thoroughbreds. Lucky Pulpit was sired by Pulpit, who was sired by A.P. Indy (1992 winner of the Belmont Stakes), who was sired by Seattle Slew, winner of the 1977 Triple Crown. A.P. Indy’s mother, Weekend Surprise, was a daughter of the great Secretariat, winner of the 1973 Triple Crown who still holds the Belmont track record. Love the Chase was sired by Not For Love, whose mother, Dance Number, was a daughter of Northern Dancer, winner of the 1964 Derby and Preakness. Perhaps what we’re seeing from California Chrome, then, is the good genes that were passed down from some of the best horses 25, 40, or 50 years ago? So, what do breeding experts look for? Oppenheim, who has lived in Scotland for the last 20 years, said the two most important attributes a racehorse can have is class (“I admit that’s hard to define, but California Chrome has it”) and that it’s physically sound (“they’ve got those thin little legs and a big body and they’re going really fast, so you have to be able to get the horse to the track, and then he’s got to run”). Waldman said he points to three main components: pedigree, race record, and conformation (a horse’s physical makeup as it relates to racing potential). California Chrome has enough of those qualities to produce wins in his last six starts. He won the Derby by 1¾ lengths, then took the longer Preakness by 1½ lengths. He was the favorite in both races, and will be the heavy favorite again on Saturday in New York. Should California Chrome capture the Belmont and become a Triple Crown winner, not only will it elevate him to stardom, it will increase his own value when it’s time to put him out to stud. He can’t change his own pedigree — and genetically, what he will contribute to a foal is already determined — but California Chrome’s on-track performance could have a greater impact in increasing the fees his owners (Perry Martin, Steve Coburn, and their wives) will be able collect for the colt’s off-track services. But the Martins and Coburns didn’t sell, despite lucrative offers to do so. Their story — neither has been in the horse business for long, and still hold other, blue-collar jobs — is just as unique as California Chrome’s. Combined, they’ve provided a spark to an industry that could use some cheer. Come Saturday at the Belmont, it just might have one.